My blog started in 2009, so there are major projects we completed before then which have not been featured as ‘Case Studies’ that we are very proud of, this is another one of those. I first meet Richard and Alison during Dorset Art Weeks 2006 when they visited my old studios at Slepe. 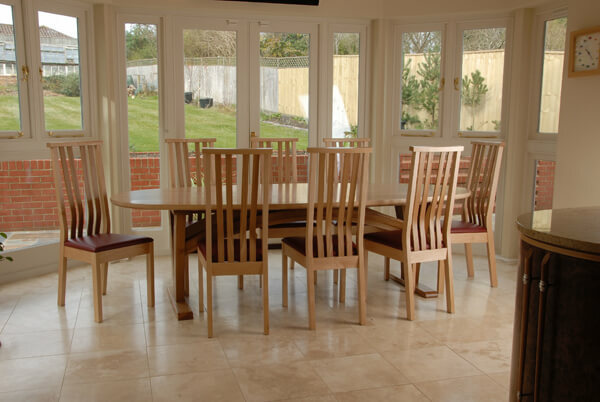 Since then we have continued to design interiors and furniture for their home in Poole, and have more planned for 2013. Sometimes you meet potential clients and you know (well think you know) that things are going to work well, both from a design perspective and a personal one. Over the 15 years my business has been running I’ve been lucky to have worked for some great clients, many of whom have become good friends. Richard and Alison would certainly count among them. The property is a classic red brick Edwardian house with lots of original features, lovely proportions and a very high build quality. They wanted to add an extension at the back of the house that was in character, but also bridged the outdoor space with a new kitchen / living area – a space where they and their children would spend much of their time. 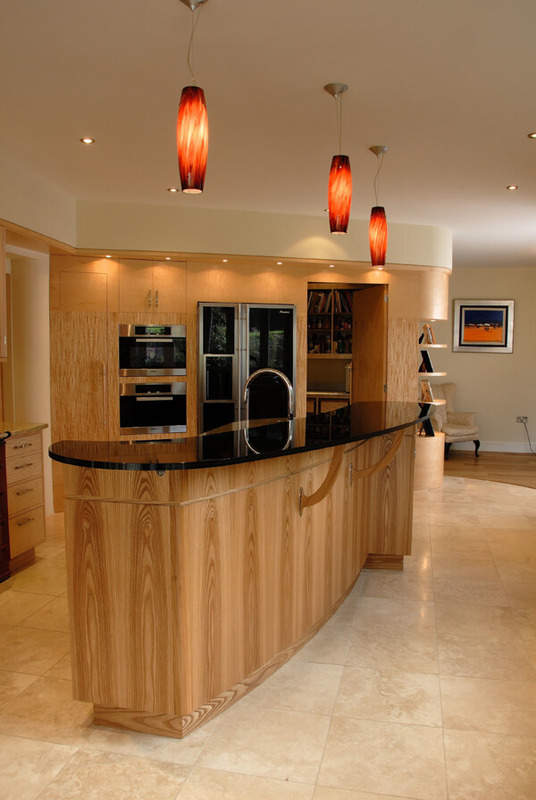 Of course they had seen previous spaces we had designed – in particular the Surrey walnut and elm kitchen (featured in a previous case study) and loved the use of soft curves which help the space flow and create visual drama. Within the kitchen space we also had a walk-in larder to incorporate and a dining table and chairs to design, so plenty to keep us busy! The start point for me is always to understand how a family live and interact, how they cook, what they cook, how they socialise (my clients always do!) and how they envisage this might change over time. It’s a detailed interogation, but the more I can get from a client at this stage the more longevity this crucial living space will have. Understanding the clients leads to good spacial design ideas. They responded very positively to the more exciting ideas like building a huge curved wall across the room to house the fridge and ovens, but also hide the larder behind. 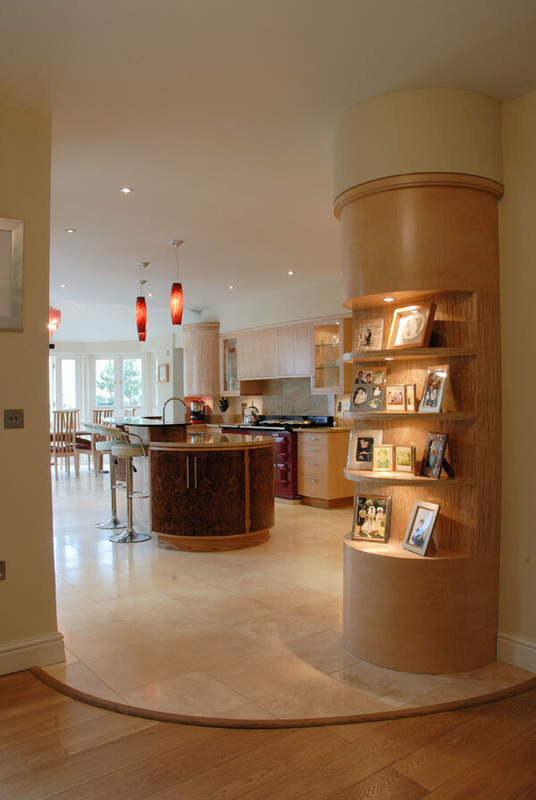 They also loved the fact we had created so many storage ideas like the sideboard / drinks cabinet, curved glass glazed units and the protruding eliptical work-surface and cabinet below. 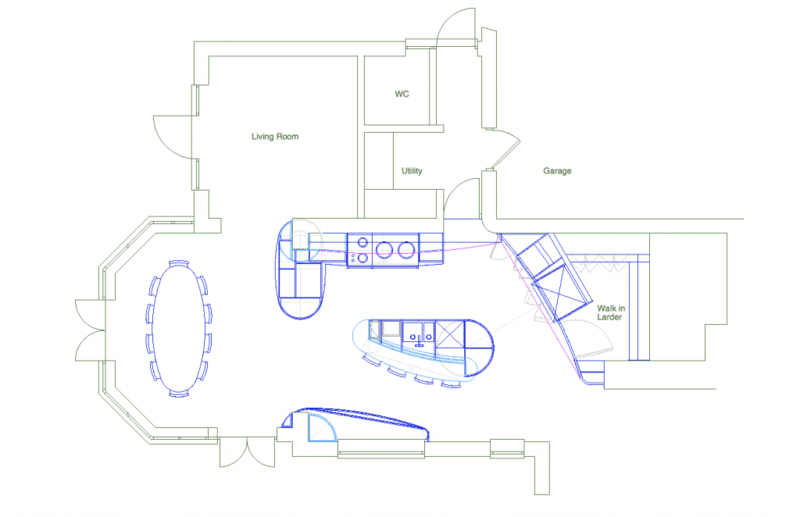 Alison also wanted an island with lots of storage, worktop, bar seating, and all the wet services in. There is lots going on in this space but I think we somehow succeeded in making it work and perhaps more importantly look uncluttered and sophisticated. Materials wise – they were happy to be brave with colour, texture and timber choice. The palette runs from mazur birch and quilted maple on the lighter scale – seen working together most effectively on that curved fridge wall. Then as the mid range tone we used red elm, most obviously on the island. The ‘feature’ doors were in a dark burr elm which also had a hint of redness. This was deliberate and echoed the red of the Aga and other objects in the room. We often use a strong colour to break the brown mid tones of the woods which can get a bit mono-tonal, especially if used with subtle wall paints and flooring as in this case. There is lots of curved surface in the kitchen, in fact there is not much that’s straight. I’m certainly not a designer that could be described as ‘minimal’- but there are plenty of others pursuing that crown of dullness. 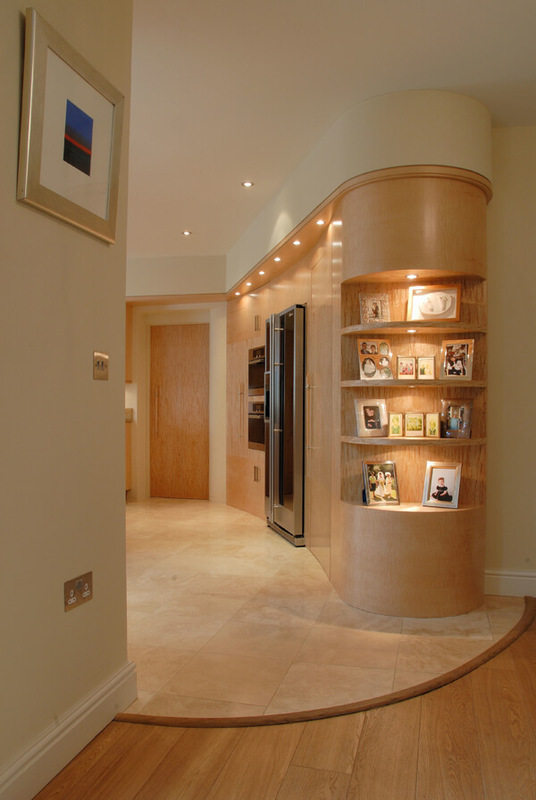 We have become experts in creating those timber curved doors and drawers over the years. We also utilised curved glass on many of the display cabinets, not a cheap option and not very forgiving either. If you get a radius slightly wrong – you can tweak timber, but you can’t tweak glass. We also used a black laminated glass top for the island bar top after lots of discussion about the right material. All the other worktops are a lovely Madura Gold granite, with lots of subtle colour and character. I love the fact this space is so exhuberant – full of touches that are not neccesary, and yes – they do add expense. Yet it’s those elements like the gently curved fridge wall with the hidden door into the larder space (insanely difficult to make by the way) and the rounded display shelves at the end of that run that are my favorite. 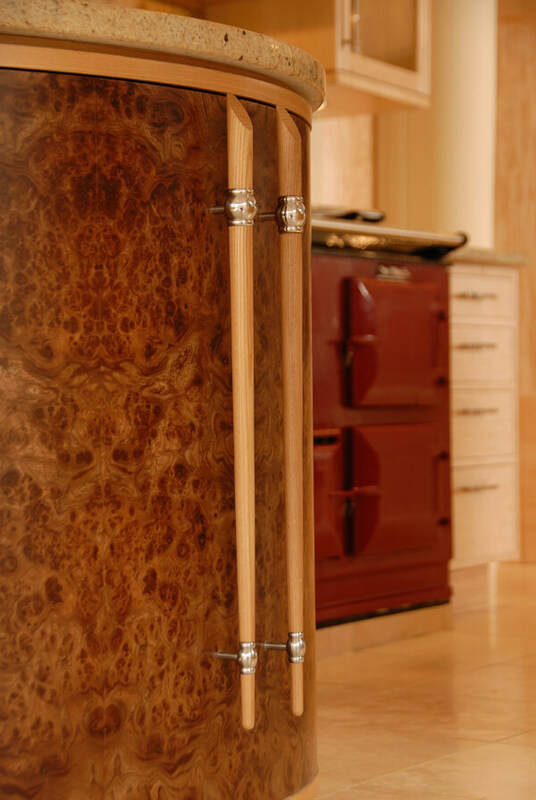 Other favorite bits – I love those bespoke handles on the feature doors, designed by us; we used a small engineering company for the stainless work. There is a real pleasure in finding other people who want to deliver the same attention to detail in another material. IP Engineering are a tiny outfit but they love a challenge! The other handles weren’t exactly ‘off the peg’ either, they came from one of my favorite metalworkers called Ged Kennett who makes wonderful stuff in all sorts of metals. Earlier this year we redesigned the utility area in the room behind to match the materials in the kitchen and maximise storage. In doing this I spent a lot of time in the house again and realised just how much I like this kitchen. It’s five years old now but still looks as fresh as the day we walked out after fitting. That’s partly because my kitchens are not fashionable: I see each one and the clients that will use them as a unique design challenge which demand a completely new solution. 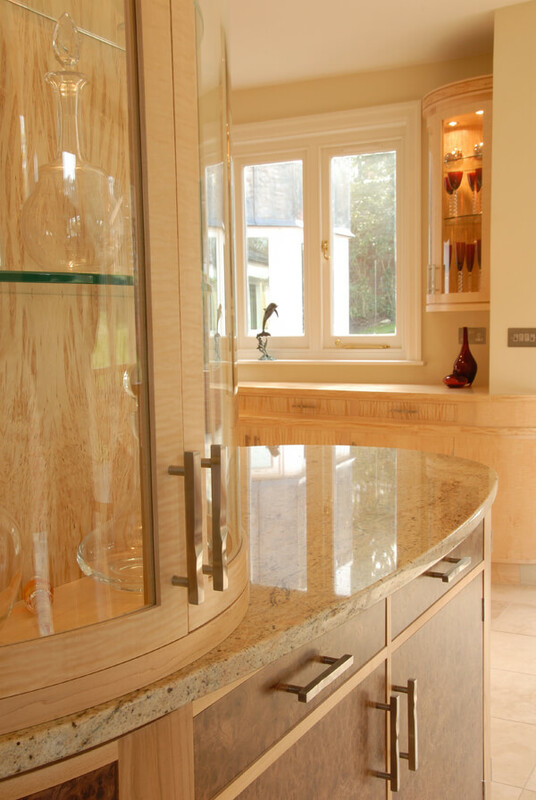 The kitchen was designed by me but made at Halstock Cabinet Makers, whom I worked very closely with for many years. At the time my own workshops were too small to do this kind of work, something we resolved in 2007 by moving to our new kitchen design workshops in Dorset. 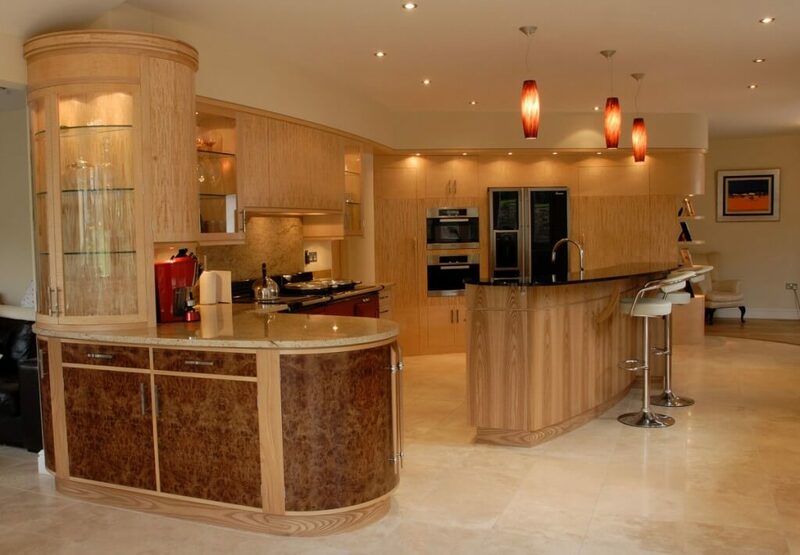 We now design and make all our kitchens and interior projects ‘in-house’.